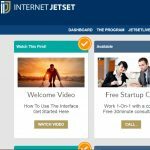 “Internet JetSet”, also known as “IJ”, is owned by John Crestani, is a highly regarded affiliate marketing training course. This course is run as part of his larger company, Super Affiliate System which offers a complete scope of affiliate services and products through Clickbank. This innovative course provides approximately 8 hours of online help on technical aspects of diverse ways of effective internet marketing. These methods range from internet stores such as Amazon and eBay to social media sites like Facebook and Twitter and everything in between. Training also includes subject matter dealing with searching for and choosing the best affiliate programs with optimal commission rates. You also get info on how to get free traffic and how click through methods and conversions work with commission revenues. Most importantly, as an affiliate marketer of Internet JetSet itself, is being able to resell the system though Clickbank for a whopping 60% commission on all customer purchases! This affiliate program includes not only upsells, also residual earnings on continuous memberships as well as individual one time referrals. The training can be extended to either additional individual modules or a 10 module pack. All of the extras get more advanced in marketing techniques as they progress through each course module. Monthly memberships offer constant updates, regularly scheduled weekly live webinars and much more. You can, of course expand your knowledge of online marketing by taking part in the training itself wile using the lessons to create new affiliate campaigns of your own. This way, you can start your own way of earning as you learn, or you can augment an affiliate program you may have already started. The lessons are well thought out and structured so anyone from beginner to advanced can understand and implement what they learn from them. Internet JetSet support is top notch and the forum offers additional hands on help from experienced marketers and students who are achieving success with it. As a sidenote, Crestani has been featured in such magazines as Forbes, Inc Magazine and Business Insider for his business prowess. Unlike many training courses out there, he makes sure you are following the lessons by implementing checks to see if you are. Crestani also created this system so that you can make your first income from doing the work within a few hours of starting your first campaign! Many users of the program have praised Internet JetSet, in online forums, chatrooms, etc., for helping them create revenue from what they’ve learned, and that is very important. There is very little negative press about the system as well. Overall, after going through the lessons, I found it to be very enlightening. This is definitely NOT a scam, and if you don’t find it’s exactly what you’re looking for you can always get a refund through Clickbank within 60 days of joining. I highly recommend Internet JetSet as not only an excellent way to learn the ins and outs of affiliate marketing, but also as a way to make money with online marketing as well.